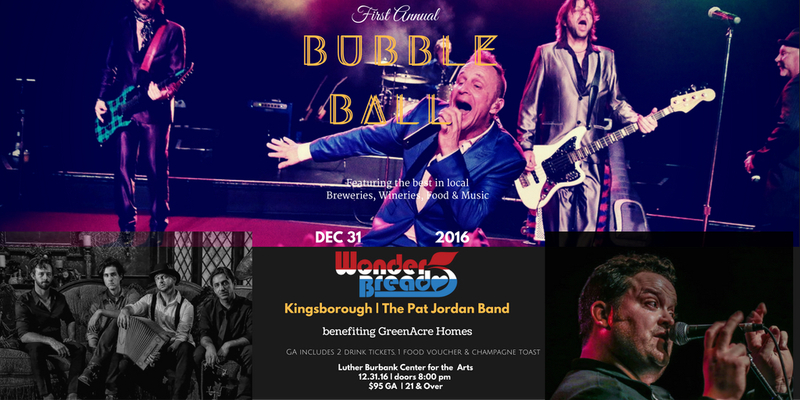 The First Annual Bubble Ball is proud to present entertainment by Wonder Bread 5, Kingsborough & The Pat Jordan Band, the best in Sonoma County Beer, Wine and Food - all benefitting Greenacre Homes & School. Come out and enjoy Northern California's premier New Year's Event all for a great cause! Tickets are on sale at the Luther Burbank Center for the Arts ticket office. General Admission is $95 which includes 2 drink tickets, 1 food voucher and 1 champagne toast. 101 North Brewing, HenHouse Brewing, Napa Palisades, Lagunitas Brew Co., Lombardi Wines, Kendall Jackson Wines and Pedroncelli Winery are just some of the fantastic local sponsors we will be serving. We are looking forward to seeing you at The First Annual Bubble Ball! ​We are grateful for all you do to support the amazing kids at Greenacre Homes & School.